So I finally bit the bullet, and I’ve migrated this blog from Wordpress on AWS to Jekyll and Disqus on Github Pages. Because that’s what all the cool kids are doing. I wanted more git in my life. My final solution ended up being free (gratis & libre), and deployment is managed entirely via git. I haven’t exactly been prolific in my blog posting, so the migration was, for the most part, pretty straightforward. There are a million posts out there that discuss making the switch, so I won’t reiterate all that here. The one topic I couldn’t find much information on, though, was how to handle URL redirection in the event that your Wordpress install retained the default Wordpress URL scheme (where all posts appear as <baseurl>/?p=<postid>). Github pages is able to perform some basic redirection, but it works by explicitly mapping old page URLs to new page URLs. With the default Wordpress URL scheme, there is essentially only one page (the implicit index.php page), and the ?p=<postid> portions of the URL are query strings – key/value pairs that are being passed into index.php. Github Pages doesn’t support redirection based on query strings, so I began searching for options that would allow me to migrate to Github Pages without breaking my old links. So I continued researching, and found a free DNS provider (CloudFlare) that provides HTTP 301 redirection services. I was kind of reluctant to change DNS providers, as I have a lifetime dyndns membership that I feel kind of compelled to use – but CloudFlare could do what I needed to do, and the switchover cost was zero. CloudFlare also provides the ability to specify a CNAME as the apex/bare domain without breaking the DNS spec. Breaking the DNS spec can result in problems. Using a CNAME is Github’s recommendation for custom domains with Github Pages, but per the DNS spec, bare domains can only be A records. 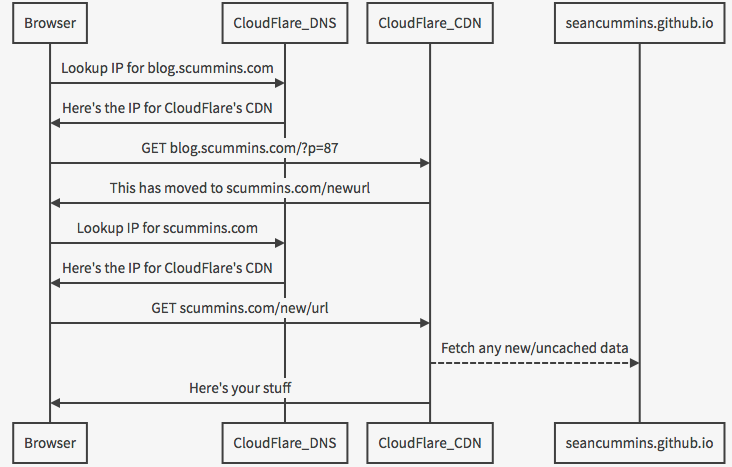 CloudFlare does some CNAME flattening magic to effectively create CNAMEs on bare domains while conforming to the DNS spec. As a bonus, CloudFlare is also provides a bunch of other services, like caching/acceleration/compression via its content delivery network; analytics; and threat management. 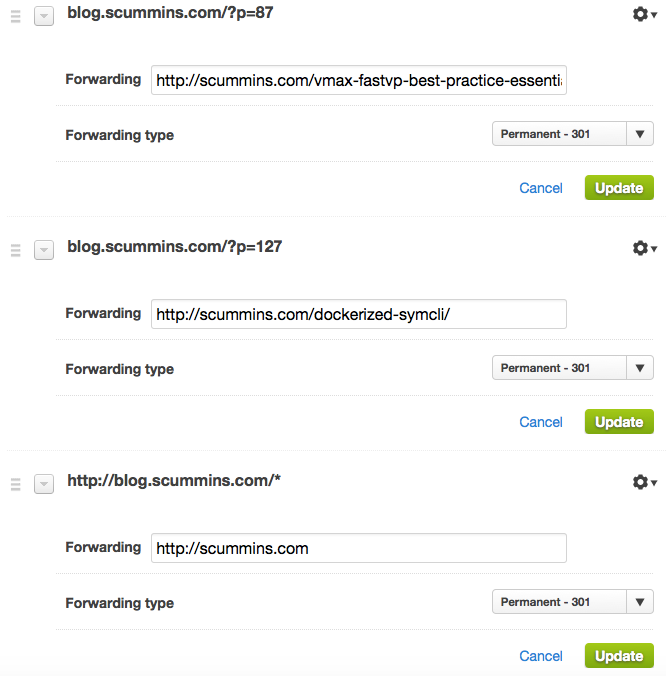 It will even cache & serve your static content in the event that your services are down. These services are offered free of charge, and there are paid plans with additional features and scalability limits.